Earlier, it was Sony's smartphone roadmap which revealed the details of the upcoming Sony smartphones. And now Fujitsu did the same for its netbook and laptops. The Fujitsu roadmap was available on a press conference and it leaked from there to the Internet. 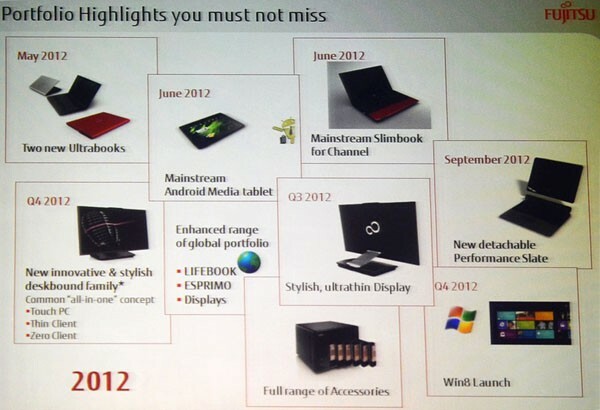 As we can see in the Fujitsu roadmap, a Windows 8 tablet with the Metro UI will be relsaed at the end of this year which confirms that we will have the Windows 8 soon in our hands. Hopefully, Windows 8 will be out in the middle of this year as Android 5 Jelly Bean is coming out in June 2012 hopefully and it will have the dual-boot Windows 8 feature too.